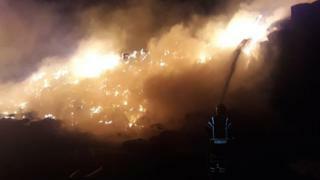 A fire which destroyed 6,000 tonnes of straw at a Leicestershire farm may have been started deliberately. Fire crews were called to fields near The Butts, Saltby, on Tuesday evening as a plume of smoke spread over the area. Eleven vehicles were deployed and found three stacks, including four tonnes of tyres, on fire. Crews said the blaze could continue for days and police confirmed they were investigating. A total of eight fire engines from Leicestershire, Lincolnshire and Nottinghamshire - along with a water carrier, command vehicle and welfare vehicle - were sent to the scene. Nearby residents were advised to keep windows and doors shut.